The original Sony PlayStation was the first video game console I bought with my own money. Re: What was the first video game console that you bought with your own money? Probably a Dreamcast (for like $25) or a Wii. I did just buy a 3DS on my own. Sega Genesis because my mom said I already had a Nintendo, lol. There were also an N64, a Sega Genesis, and a Sega Dreamcast in my home growing up, and I'm pretty sure that my parents bought them, but those weren't technically mine and I barely played them. I made the switch from Nintendo consoles to Sony Consoles because of Final Fantasy. Hard to remember. The first systems I remember buying with my own money is the Gamecube and PS1. The Nintendo 64 came out in '96 when I was 17 so I'm assuming my mom bought it for me. Might have bought an Atari 7800, but can't quite recall. Own one now, but it's more modern. I bought a NES then returned it, so that probably doesn't count. Definitely bought a Sega Genesis. And most systems since then. Parents bought Pong, Intellivision and Atari 400. My first purchase was NES. Oops, misread. First console I bought with my own money was the PS2. Atari VCS (later renamed the 2600). First video game with blood I ever owned: D. Followed shortly by Die Hard Trilogy. And I snuck a Resident Evil purchase in there (mom was NOT happy about me buying a game called Resident EVIL). First bloody video game I ever played: Mortal Kombat 2. Original Xbox, which was also my first console. My parents weren't fans of consoles. I put $100 towards the $179 (+ tax) for an Atari Lynx in 7th grade. The first console I bought 100% with my own money was the original Xbox in 2002. I was a college graduate by then, and...y'know, no one's really buying me video game consoles at that age. I think it was the Xbox 360. My brother and I paid for part of our PS2. Parents bought the NES and SNES... I made my older brother buy the original Playstation, so that doesn't count. So it'd have to be the Dreamcast, which I bought the week after they announced that the system was dead. Picked up the system and bunch of games from the video store I worked at for dirt cheap. My family had an atari 2600 from the very start. It was in the front room of course, and the family would sit around and play it. My older brother and I spent most of the time on it. He got some games for his birthday, with Yars Revenge being one of them. He refused to let me play. He was out with his friends, and I decided to start playing it. He came home and found me and we got into a big fight. My mom worked overnight, so she was asleep at the time. She stormed out of her room screaming...grabbed a broom and started bashing the atari over and over. I still remember my brother and me crying out...with real tears coming down my cheek ....and I screamed "Your killing it!" 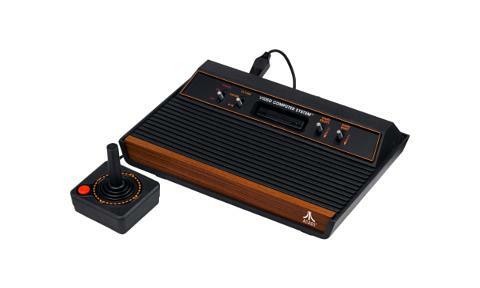 I saved up money and mowed lawns until I had enough to buy another Atari on my own. I also bought Yars Revenge and remember being disappointing.